Organic lifestyle is NOT just about food! - organic beauty products and organic personal care can also STOP your skin literally 'eating' pounds of toxins over the years. To cut to the chase: If you are looking for truly organic skin care. hair care and cosmetics products, and possibly organic baby skin care products, then check out the wealth of information and the shop at Safer Alternative - Organic Cosmetics & Personal Care. But don't forget to come back and finish this article and claim your free "Toxic Skin Product Ingredient Spotters Guide" (below). Whilst it is useful to 'go natural and organic' at the dinner table - it is the 'silent' intoxication of your body via your skin you should also be aware of. Are you slowly poisoning your skin? Your skin can absorb as much as 50% to 60% of the substances that it comes into contact with. Daily you will probably be exposing your skin to layer upon layer of toxic cocktails that masquerade as 'harmless' personal care and cosmetics products. Almost ALL 'off-the-shelf' body care/hair care/skin care and cosmetics ranges contain a combination of synthetic chemicals, many of which have a dubious reputation at best and are known to be toxic at worst. The manufacturers fall back on the old excuses for using these ingredients: the quantities used are minimal; there's a lack of firm evidence of harm; the experimental work was done on animals (and so it may not apply to humans)...and other such 'unconvincing' blatherings! A simple rule is just to think of the motto - "If you wouldn't put it in your mouth then why would you rub it on your skin" - and consider 'detoxifying' your personal care regime and 'bathroom cabinet' today. Changing to CERTIFIED organic skin care, and organic beauty products will radically reduce your daily exposure to a wide range of toxic substances. THINK - no matter how long you have 'innocently' smeared yourself with your current 'toxic' personal care choices it is NEVER too late to change to certified organic personal care, organic beauty products and cosmetics. What you must realize is that most probably no ONE toxic chemical ingredient will 'cause a specific disease' - BUT the regular abuse and undermining of your immune system through constant assaults by the numerous dangerous chemicals your skin absorbs daily COULD lead to you becoming susceptible to any number of serious health challenges in the future. TAKE PARTICULAR NOTE: There really is NO serious experimental work to show the effects of the many layers of toxic chemicals (in the guise of cosmetics and skin preparations) that many women apply to their skins, faces and bodies every day. There is also NO reliable experimental evidence that can indicate the risk, or otherwise, that the interaction between chemicals might pose to health during long-term repetitive use! ...As long as you keep on using toxic chemical personal care - deodorants, body wash, shower gels, liquid soaps, shaving foam, aftershave, moisturizers, cleansers...and so on. AND THINK TOO - If you are habitually buying synthetic chemical based products for your family to use...what are the coming decades of such BAD HABITS going to do for your children? You should be setting the best example now - and reducing the undoubted threat to your own and your children's health by 'choosing to defuse' the toxic time-bomb that is ticking INSIDE US ALL. all they're 'made-up' to be? But DO BEWARE! When you are looking for organic beauty products and skin care - ALWAYS check the label before you buy. There are many examples of well known brands jumping on the 'natural' and 'organic' bandwagon with products that simply do not live up to expectations. Unless the products you buy are 'certified organic' and carry an acknowledged third party organic certification - then the organic beauty products and skin care products you choose may not be all they are trying to appear to be. So always CHECK the LABEL just as you may do with food already. Look out for the toxic chemicals - and avoid those products that contain any of them. 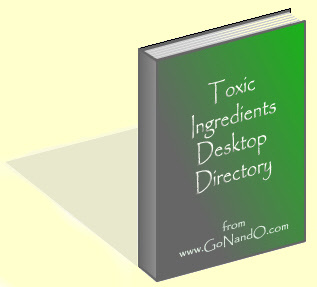 IF you don't know which 'synthetic chemical culprits' to look out for - obtain your copy of our PC Desktop Guide To Toxic Chemicals in Skin Care & Cosmetics" NOW (SEE BELOW)...Only then can you confidently rely on the organic cosmetics, skin care, and other products that you invest in to help you reduce your own, and your family's body burden of toxins! ...Go NATURAL and ORGANIC!...CHOOSE CERTIFIED ORGANIC products - which are the ONLY products on the market today that you can be reasonably sure have reliable ORGANIC AUTHENTICITY. in your personal care and cosmetics products? ...besides being able to check that you are using truly organic beauty products in future, you'll also be supporting the maintenance and development of www.GoNandO.com into the bargain! So -- thank you -- in advance if you make a purchase today!